awfully big reviews: THE TRIBUTE BRIDE by THERESA TOMLINSON. Reviewed by Penny Dolan. THE TRIBUTE BRIDE by THERESA TOMLINSON. Reviewed by Penny Dolan. This fascinating historical novel, by a twice Carnegie-nominated author, allowed me to spend my weekend back in seventh century Britain. I loved the experience, even though it made me appreciate my own life and freedoms. THE TRIBUTE BRIDE could be a book for older teens who love history, for young adults interested in the role of women in past and present societies, and is also a fine read for grownups. This is a novel about power and resilience, courage and survival, and about the possibilities of friendship. I am slightly biased, as the story is set in the north of Britain, among landscapes I love, so there was a pleasure in matching the journeys and places against modern maps. The book had clearly been well researched; every page offers glimpses of everyday life: the cycle of the months and years, the power and role of dress and ornament, the importance of the rituals of court feasts and religious rites as well as the dangers of battle, the fear of famine and the anxiety of childbirth. More than that, THE TRIBUTE BRIDE is a dramatic story. When Aelle’s kingdom of Deira is devasted by floods , he has no grain to pay his tribute to Athelfrid, the powerful war-lord of Bernicia. So King Aelle sends his sixteen year old daughter north, hoping she will be accepted as tribute instead, and be a peace-weaver bride between the kingdoms. Acha, young enough at sixteen to give the warrior Athelfrid the sons he wants, is accepted, although she too must accept being in second place. Athelfrid already has a wife, the beautiful Queen Bebba. For a short while, Acha is won over by her husband’s charm and glamour, but soon his attention shifts back to battles and to Bebba. Acha soon learns how true he is to his nickname and his personal god: the Trickster Loki, when without asking he takes back his wedding gift of brood-mares for his own warriors. Left with only a few colts, Acha must recognise that Athelfrid acts as lord and owner of everything and everyone. Fortunately, helped by her wise old servant Megan, Acha’s attractive and generous spirit guides her to act in ways that brings her firm friends. Eventually, she even finds a sister and fellow-mother in the Pictish Queen Bebba, and it seems her life as a princess is settled. However, all is not over. During what should be Acha’s moment of greatest happiness, she discovers that Athelfrid has, been playing a long and treacherous game, and that she and those she loves are caught up in it. 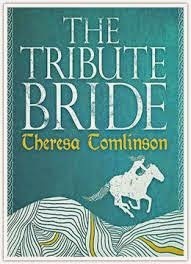 The Tribute Bride by Theresa Tomlinson. Published by Acorn Digital Press.